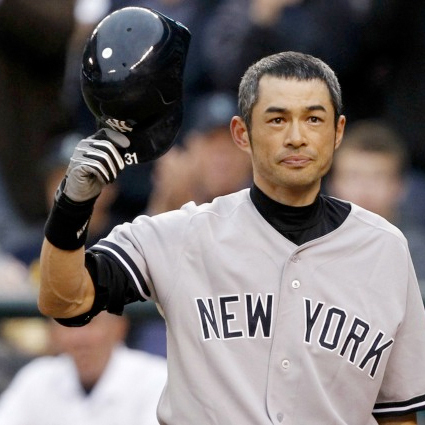 Ichiro Suzuki has been making spectacular plays in baseball for 20 years now. The first decade, he spent as a superstar in his home country of Japan. The second decade, he spent in Seattle playing for the Mariners, where he became one of the greatest and most exciting Major League Baseball players of all-time. He's a guaranteed Hall of Famer. No one has ever gotten more hits in a single season than he has. No one has ever gotten 200 hits in 10 straight seasons like he has. And he's the only person to ever hit an inside-the-park home run during an All-Star Game. In an era of steroid-fueled hulks launching home runs into the stratosphere, Ichiro has played with an an old school slap-and-dash style that has made him a fan favourite. Our friends over at the Getting Blanked baseball blog include an exclamation mark every time they write his name. Ichiro is also one of the greatest interview subjects in baseball, delivering bizarre and hilarious quotes that may or may not be the result of translation issues. On facing a superstar Japanese pitcher in the Majors for the first time: "I hope he arouses the fire that’s dormant in the innermost recesses of my soul. I plan to face him with the zeal of a challenger." On playing a series in Cleveland: "To tell the truth, I’m not excited to go to Cleveland, but we have to. If I ever saw myself saying I’m excited going to Cleveland, I’d punch myself in the face, because I’m lying." On how his dog convinced him to stay in Seattle: "He said, ‘Woof, woof, woof,’ which meant, ‘Stay, stay, stay,’ Of course, I listened." The Baseball Posts are series of posts about, uh, well, baseball. You'll find them all here.